Hal, hope the surgery went well and your recovery is speedy. 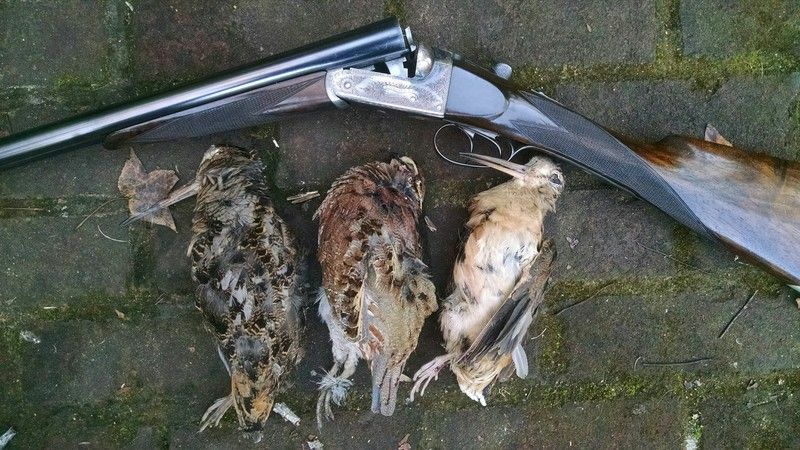 Started woodcock season over the weekend. Went one day over the weekend and played hooky yesterday. Bonus quail where we didn’t expect a covey. In the wettest, thickest place you can imagine and still not be standing water. MutPac (Abby and Willa depicted) plus Sadie, buddy's Brittany. Gunwork below standard set by dogwork. I don't have a story for you Hal, but I know Gil is itching to tell me one about that beautiful SxS. Maybe I've inquired before about that one ??? Neat gun. I certainly have a soft spot for the old doubles. She's a beauty. I already texted you a goodun the other day with Lily and the Ducks! That should have held you over a day or two. I teased her all morn bout that. She asked what happened, and I told her,... you screwed the pooch!!!! She has not learned how to use the new pump just yet, and had an empty chamber with a bunch of Mallards falling on her in the swamp. Now, a pair dropped in on me this morn. Gun hanging in a tree. Didn't see or hear em coming. She looked at me and asked, what happened?? I say, I screwed the pooch! We both laughed at that one. Yep, still hunting. Ducks in the morn, Deer in the eve. Pretty much every day. I see bout 15 to 25 deer every eve. Same Deer every day though. Just a couple scrub Bucks at the moment. Still waiting on the Big boys to come check out the girls. Hang tough Hawg. Your pain eased up any yet? Oh, almost forgot. This happened this morn in the swamp. You'll get a chuckle out of it,... but we didn't!!! OUCH!!!! This swamp is probably 500yds square. Once we get in the water, we probably go 200yds in water from half way to the knee to over your crotch. Picked up Dekes and was heading out bout half way out of the water knee deep. Still don't know what happened, cause I didn't trip or step in a hole or anything. My bad leg just gave up. Went in left arm first up to my shoulder. Dunked the M1 Benelli. The water was so cold, My arm went numb. Couldn't get out fast enough so I could take my upper clothes off to wring out. 50yds of getting out, there is a 12" around log about a foot under water in knee deep water we have to step over. Lily seemed to have forgotten about it. Yep, you guessed it. She took the plunge too. Both arms to the shoulder. Saved the gun though. Shell bag got it. Nice mile and a quarter walk out of the timber to the truck! Last edited by Shooter on December 9th, 2015, 9:29 pm, edited 1 time in total. I was bird hunting along the river here in NE Colo and Pine, my Wirehair, slammed into a point. One of those points where the dog is running along, hits scent, then turns and skids to a stop. He was intense. I move in with gun at the ready and when I got about 6 or 7 yards from the dog it flushed. Except it really wasn’t a flush…a red fox jumps up and runs. The dog gives chase but I bark out a strong NO, and he stops. I see the fox running on and figure he is long gone. I couldn’t believe the fox let us get so close, but the wind is howling and maybe we just surprised it. About 300 yards later Pine is 80 yards in front and I see him jump the fox again. No point this time and he gives chase. I yell NO! Pine either doesn’t hear me because of the wind, or his selective hearing kicks in. He just missed the opportunity of a lifetime and he isn’t going to let it get away again. I really don’t think Pine will catch the fox but still don’t want him chasing it. Then the fox makes a hard right and decides to cross the river. Big mistake. The river is about 30 yards across and from 1 foot to 3 ½ feet deep. Pine has longer legs than a fox. He catches up to the fox about two thirds of the way across the river in the deeper part. I am moving as fast as my gimpy leg will let me (bad hip) and can see Pine’s head go toward the fox and quickly snap back 5 or 6 times. When I reach the bank of the river Pine grabs the fox and starts back to me with the retrieve. I cross a small, shallow part of the river and meet Pine on a sand bar. He looks so proud bringing me back that fox. When Pine drops the fox at my feet and looks up at me with that dog smile all I can muster, in a normal monotone voice is, “You’re not supposed to do that”. I’ve had my dogs bring me various things over the years. A few rabbits, some birds, mostly crippled and a few not. Even a hen turkey one time. I never, in my wildest dreams, thought my dog would bring me back a red fox…much less on a water retrieve! looks up at me with that dog smile all I can muster, in a normal monotone voice is, “You’re not supposed to do that”. We just got back from a NEW Experience in Wisconsin! We were invited to the Maribel area just SE of Green Bay to film a Fall Turkey Dog Hunt for TV! 18 Hours Trip split up in 2 1/2 days and Jinger Lou was ready to hunt! First morning the film crew got held up so we hunted early without the cameras! Turkeys located leaving a Corn Field and entering a Mixed woods with some swamp! 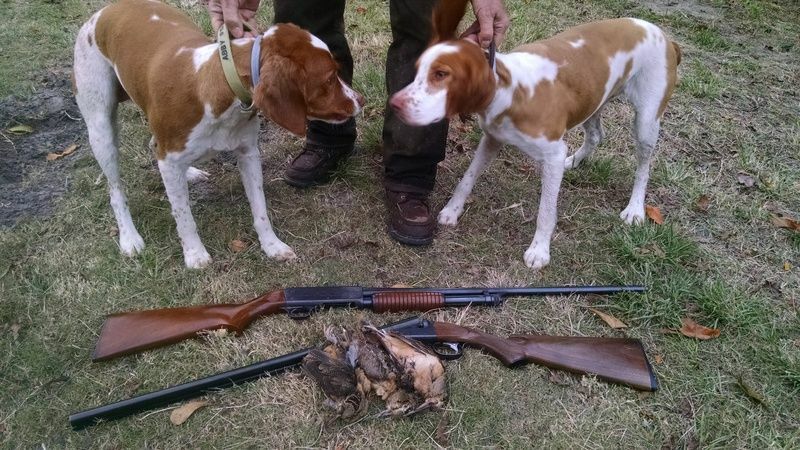 Lucky and Jinger Lou picked up scent and did a WONDERFUL BREAK on the birds! WOULD HAVE MADE A GOOD FILMING SESSION! Well-- over an hour of calling resulted in one bird answering and coming into sight - ONCE! But it was Fun! So we meet up with the film crew and the FUN BEGAN! HOLY CRAP! Microphones, Wires, Camera man, Sound Man and Interviewer! 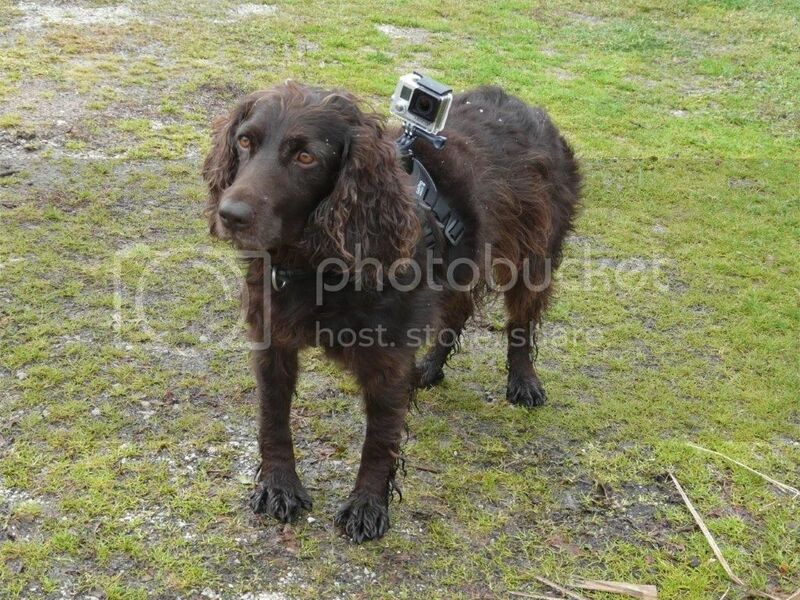 Then they pull out a GoPRO! They had NEVER USED ONE ON A DOG! We decided to try it on Jinger Lou as she DOES NOT RANGE as far as Lucky! Lucky will put on MILES in a Forty Acre Woods!!!! Amazing to watch! They had a harness and all. Jinger Lou took it like a Champ and gave them a Bit of Footage. Only Trouble is that she was Tired from all the Road Time and a Big Break in the AM! So it was only on her for a little footage and then we removed it before she got hurt! Now as to making a Show! 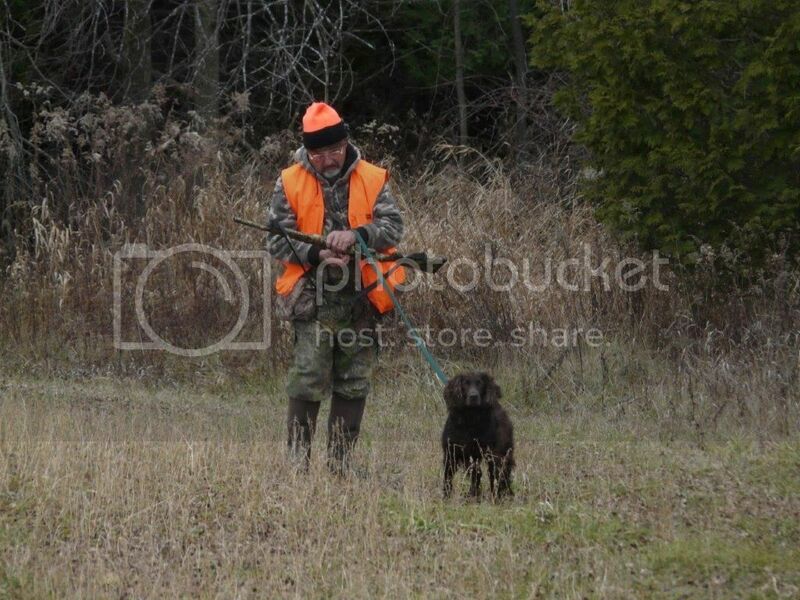 Wisconsin Muzzle loader is in at this time so ALL have to wear Hunter Orange! Just picture this: Hunter/Caller, Camera Man and Sound Tech ALL IN ORANGE! It was a Challenge and all I got was answers and a Turkey getting to within 20 yards in THICK CEDAR to fly up at Dusk! I PLAN on being back there in Early October when there is No Orange and try it again ON FILM! Just a heads up for you Ron. There is a youth rifle deer hunt in Wis on a certain weekend in Oct. Usually the 2nd weekend I think but not sure. Orange is required that weekend. If I am in Wis that weekend I do cabin chores and/or go duck hunting. That will give us a Couple of days to Rest Up when out there! Ron, you got anymore turkey hunts left? My turkey and deer season is over for 2015 but I'm fixing to start yote hunting hard if this weather will ever break. It's warm here for December. Hope your healed up soon. I have a Standing Invite for Virginia Winter season! SOME YEAR, Maybe! 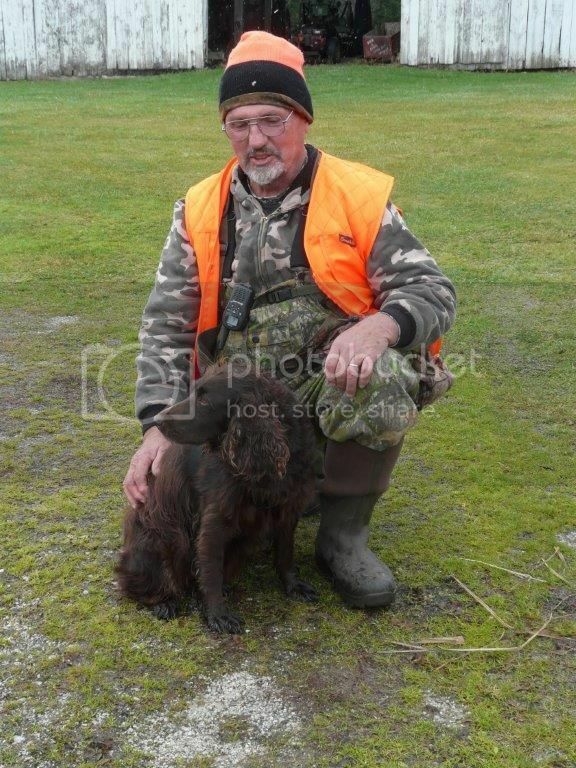 Yes, I have a Virginia license, I plan to hunt with my dog Maizy (12 months, dropper) a few more times this year. She's been in on a number of busts, and has watched two birds killed so far this season, hopefully she'll see a couple more birds shot . Heading down this Friday, can't wait! Not turkeys...our duck season ended today. I went to a flooded cornfield this morning and managed to get four mallards one gadwall and a Canada goose. Not a bad way to end the duck season. The weather was warmer here, no il, today than it was 60 days ago on the opener. My 1.5 yo lab molly is turning out to be a fine hunting dog. She had been on good ducks up in Manitoba and has had some good luck finding pheasants back home. Also got one woodcock this year while chasing roosters. He went in blind to a place he killed a bird once before, and actually walked under some roosted hens before first light. He backed out and repositioned. Started calling and got a bird to gobble twice shortly after flydown. Ended up working a group that he knew had some gobblers in it because he saw fresh gobbler tracks in the snow. Got them to work over close enough and was able to put the bead on one of the gobblers.